Photo: Claire Esparros/Courtesy of Homepolish. It only took one (sneak) peek at this Brooklyn Heights office space for us to see that the folks at Homepolish — the interior geniuses responsible for the streamlined makeover — know what they're doing. Whether it's a total renovation or culling the perfect finishing touches, designer work by the hour to create a balanced space that just works. This article was originally published on October 29. Moving in with a boyfriend or girlfriend — and merging all of your belongings — can be a bit of an emotional minefield. You’ll inevitably need to purge some items and keep others (especially if you live in a small space with limited storage), but you don’t want to step on anyone’s toes. So how do you tell your boyfriend his tattered Reservoir Dogs poster needs to go without hurting his feelings? What’s the best way to create a stylish, pulled-together home, especially if you have wildly different taste in decorating? 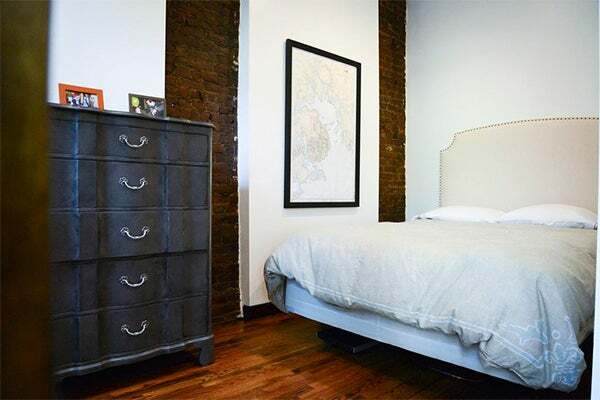 Case in point: Shef and Libby, both 26, recently relocated to NYC after dating long-distance for a year and a half — Libby was finishing up her law degree in Washington, DC, whiled Shef was working in SF — and couldn’t wait to deck out their new, 500-square-foot, one-bedroom apartment in Chelsea. Shef and Libby had wildly different styles, and didn’t know where to start: “If we were neighborhoods in Manhattan, Libby would be the UES and I would be Tribeca,” Shef admits. 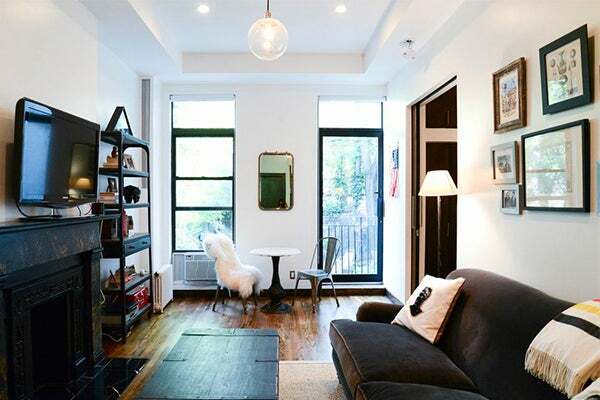 “I’m drawn to color and bright, preppy patterns, while Shef prefers industrial and “Americana” décor, according to Libby. Luckily, both admired each other’s style and were open to Margaret’s suggestions. “To be fair, I had some terrible ideas in the beginning,” Shef says, like two massive 6-foot-tall vintage letters that spelled ‘SF’ — which Margaret nixed, because they would overpower the small space (not to mention probably wouldn’t fit through the door). “I mean, if it were up to me, the entire place would be decked out in stripes.” Libby says. With Margaret’s expert guidance, they ultimately settled on a mix of Industrial Americana with bits of British and nautical accents scattered throughout. 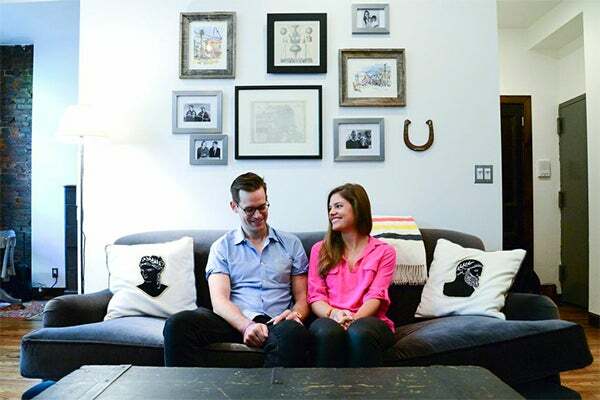 Click through for simple steps to decorate your place as a couple, without going crazy. Newly Single? 10 Ways To Redecorate Your Space, STAT. 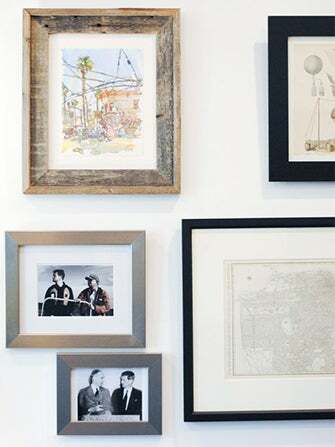 Creating a gallery wall is a great way to make both partners feel at home in a space because each partner can contribute to it. Plus, you can add to it over time. After relocating to NYC from SF this past summer, Shef was feeling a little homesick, so Libby made sure to incorporate lots of San Francisco elements — like a handmade drawing of the Mission District in SF, the neighborhood where he grew up. Make big decisions together. It’s important that both partners are on board with all the big-ticket items (like the sofa and the dining table, which were Shef and Libby’s biggest purchases). You don’t both need to be head-over-heels for each and every piece, but if one partner hates something then they won’t feel comfortable in the space. If your significant other is moving into your space, be sure to create additional storage. This means clearing out an existing storage piece or investing in another one. Be creative! 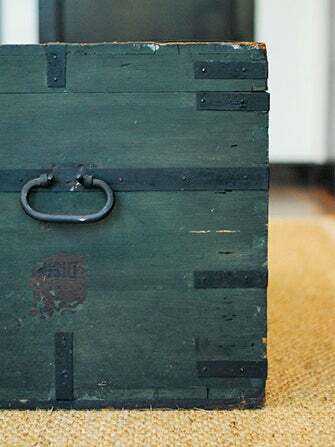 A trunk that functions as a coffee table — like the vintage green trunk in Shef’s apartment — is a great non-traditional storage solution. Surprise each other! Find the perfect vintage accessory for your partner then give it to them after you’ve moved in. It’s finishing touches like these that make a space feel like home. 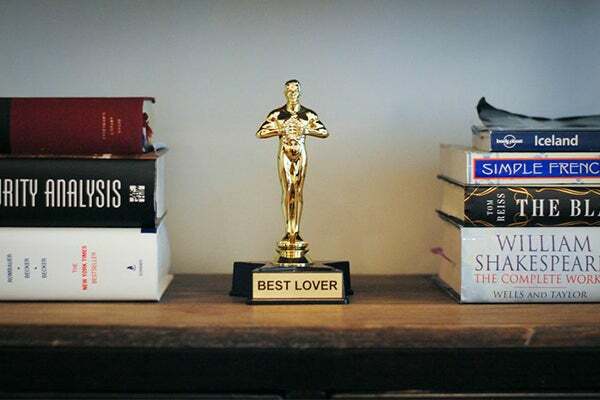 Libby purchased this playful trophy at a CVS when she was at Cochella a few years ago, and surprised him with it later that night." Most partners don’t have the same style when it comes to home décor – and that’s okay. You can mix two styles by sticking to a shared color scheme. As a kid, Libby was obsessed with elephants, and had a massive collection of stuffed animals and toys. 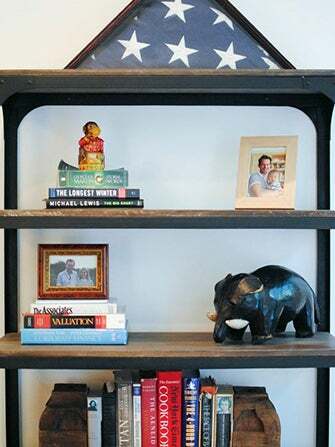 She purchased this handmade elephant sculpture for the bookcase, as an homage to her childhood. Incorporate items that are meaningful or nostalgic for both partners. Libby and Shef's gallery wall not only features family photos, but it also includes items that they picked out together, and gave as gifts to one another. Choosing more personal pieces allows each partner to connect with the space in their own ways and together. To find out more about how Homepolish can help you create your own space, click here!